New classes are added every month. Jump start your year and motivate your employees with an IT Kickoff Meeting. You won’t believe the positive results you can get from doing this. This training session gives you step by step instruction on how to deliver a successful and memorable IT Kickoff Meeting. Use this process and tools to develop a Professional Development Plan for yourself that helps you focus on your career. The program is also ideal to use in providing career planning focus for your employees. Includes a comprehensive process and tools you can use immediately. There are three main reasons why an IT organization fails. Each of these issues can do major damage to your career. Learn what the three threats to IT success are and put in simple preventive measures to improve the success of any IT organization. There are some key things that IT managers need to pay attention to. Many of them you are probably already aware of but may not place that much importance on. Some will be things you aren’t aware of that can have significant impact on the success of you and your IT organization. 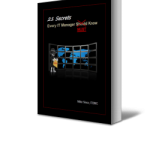 Included with this webinar is a download link for a free copy of Mike Sisco’s book, 21 Secrets Every IT Manager Should MUST Know. In my CIO role, I led the IT due diligence and assimilation activity to support 45 company acquisitions. To do this I developed an IT assessment discovery process and tools to help me do the work quickly, consistently, and effectively, , , I probably have the most resources in this area in the industry. The webinar includes a significant amount of BONUS resources and tools/templates you will be able to download upon completing the program and use immediately to assist you in due diligence and assimilation work. Use this process effectively for IT due diligence and assimilation activities as well as general IT assessment and transition situations. This is a 3-part training program. IT projects can be challenging to get approved, especially infrastructure projects. This training class dives into the key pieces you need to have in place to get senior management’s approval and gives you a “Cost of Downtime” tool to help you communicate and sell your project recommendations. 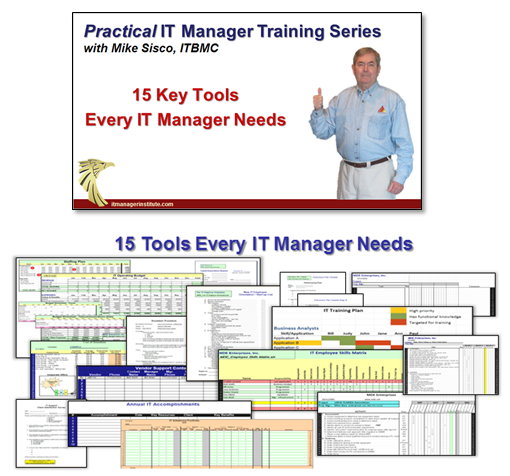 Watch the training video that shows you how to use what I consider to be 15 tools every IT manager needs. Plus, download the tools and you can use them “as is” or customize for your specific needs. Project management does not have to be complex and there are a few simple things you can do to improve project success significantly. This training program discusses the dynamics involved in delivering projects successfully plus I show you how to take a direct and simple approach to develop a concise Project Schedule in just minutes. Work demand can easily get out of control and over burden an IT organization. You need a process to manage the intake, review and approval of requested projects so you work on the most important ones plus work within your IT organization’s capacity. This class takes you step by step through the entire process in just 30 minutes plus we include tools that will help you implement a Project Portfolio Process quickly. PowerPoint is a powerful tool IT managers need to be familiar with. I walk you through the 20% of the functionality that will help you become a PowerPoint guru in no time. Create better presentations and make yourself look organized and professional using these tips. IT employees have amazingly consistent personalities or work behavior. In most cases these traits work to our advantage, but there are a few “gotchas” that we need to be aware of, , , both for ourselves as well as for our employees. Learn this “insider knowledge” from my more than 15 years of measuring and evaluating IT employee work behavior. A key aspect of this class is to become aware of the fact that some of our personality traits that help us succeed when we are technical experts actually work against us when we become IT managers. I explain what these traits are and how to overcome them. 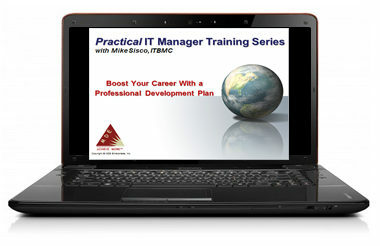 This is a MUST ATTEND class for any IT manager. 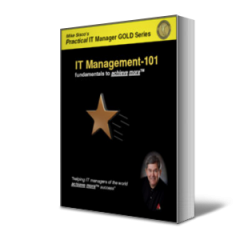 This class walks you through step by step how to start managing any new IT organization and I share some “little known secrets” that can help you succeed in your IT manager role. The most fun part of managing an IT organization is developing and motivating your IT employees. These two things go hand in hand. In this class we discuss simple and inexpensive motivation techniques to help you build a world class support team. Motivated employees have higher energy and accomplish much more so this one is important for you and your organization. Managing Software Developers (Programmers) is simpler and more straightforward than you might think, but you need a process plus a few tools to organize, monitor and manage them with. I’ll give you everything you need to take charge of this group quickly and help this team become more productive than ever before. Streamline your budgeting effort with a practical process and tools to help make budgeting simple and easy. 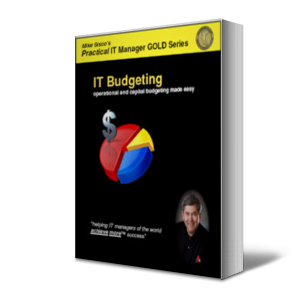 Includes a short accounting overview to give you a solid foundation and step by step instruction on how to develop an achievable IT budget. GUARANTEED! Also includes a free BONUS DOWNLOAD copy of my book, IT Budgeting: operational and capital budgeting made easy (a $30 value) plus all the tools I use to blitz through a budgeting project. It’s vital for you to understand how your clients feel and think about their IT support. Use a simple survey and the process I teach in this class and you will have a significant appreciation for how well (or how poorly) your IT organization is doing. I’ll show you the specific questions to ask to evaluate IT respnsiveness, effectiveness and level of professionalism your team exhibits. Plus, I’ll give you a few tips that guarantee you receive response from 100% of your clients so you truly know what they think about the IT support your team provides. Training and education is a huge motivator for IT employees. It ranks high in every study and has done so for many years. Because of this, every IT employee should have an annual training focus, , , it is simply too valuable to miss. In this class I will give you a step by step process and tools to develop key training objectives for all your employees so you motivate and develop them plus eliminate knowledge silos that tend to exist in an IT organization. Whenever I consider creating a training class to meet certain objectives with my IT Organization, I always think about creating a recorded class to give me a training asset that can be utilized later. CREATE ONCE and USE MANY TIMES! This class gives you everything you need to know to create a “recording studio” in 1 week and for less than $1,000 in order to leverage your training development and delivery efforts. Credibility doesn’t happen automatically for an IT Manager or for an IT Organization. Some might even say, “It’s very difficult to become credible in IT!” The reality is that it’s actually simple for IT Managers to achieve credibility if they know what the key factors are for becoming credible and follow a few fundamentals. Learn all about earning IT credibility in this video and create the trust and respect you deserve for yourself and your team. We spend most of the hours we are awake at work plus IT management is a challenging role to be sure and can be very stressful at times. Our employees deal with this as well so it’s important for you as the manager to set the tone that it’s not completely about work. We can have fun at work and when you do productivity goes up. It all begins with you so this class provides tips and techniques to help you (and your IT staff) have more fun at work, , , all to achieve more success. Delivering effective presentations can help set you apart from your counterparts and make a BIG difference in your career. Follow me in this 40-minute class as I help you know what to avoid and also provide some of my best tips on delivering powerful presentations that have an impact. We spend a lot of time in meetings; you want to get real value from this investment of time. This class walks you through a process that will help you get more benefits from your meetings and help your team achieve more success. Included are 20 tips that will help you hold more effective meetings plus a guide to help you prepare for and manage virtual (online) meetings more effectively. I’ve worked with hundreds of IT managers in my career and have seen some good ones and many not so good managers. I’ve summarized in this class what I believe are 11 key traits that a successful manager needs to have. The strong IT managers I’ve worked with all have these traits, , , you need to develop them too. Your IT Organization offers your company more leverage opportunity than any department in the company. This class dives into the leverage opportunity you have and discusses dynamics that prevent an IT organization from succeeding. We also show you how to close the gap between IT and the Business. 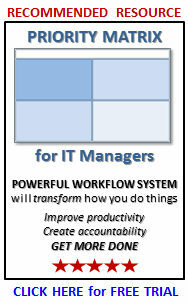 Plus, I’ll give you insight into the 4 key things every IT recommendation must have. Become consistent with this and you gain partners at the executive level, something that positions you for more success. You can’t be successful if you can’t quantify what your team needs to work on and the priority in which they need to attack your objectives. Follow me in this class as I walk you through a step by step process I’ve used in conducting over 60 IT assessments. Senior managers will be amazed at how much insight you can gain during an IT assessment in so little amount of time. Included is a free download of my book, IT Due Diligence: merger and acquisition discovery process plus the tools discussed in the book and the training class. This process works great for a company acquisition, but the same process and tools work equally well for a general IT assessment when you are joining a new company or if in a consulting role. I’ve been a “new IT manager” in over 60 situations, , , a few as a new CIO joining a company, some when additional IT organizations were added to my responsibility, and in 46 company acquisitions where I conducted the IT due diligence and assimilated the technology resources into my IT organization. Another situation this class is great for if for the first time IT manager who is just getting started in their management career. Use the proven process I’ll give you in the class and you will be off to a fast start in your new manager role. 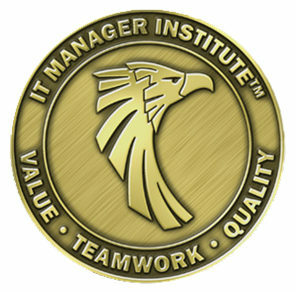 The first class in my IT Manager Institute Program sets the stage and discusses many of the dynamics that are taking place in and around an IT Organization. The class is titled, IT Manager Foundation. It’s critical for every IT Manager to be aware of these issues because they can hinder, even prevent you from achieving success. The key to keeping IT aligned with your company is to develop a practical IT strategy for your company, review it with your senior management team, and gain their support. This book takes you step by step through the whole process and includes a free download copy of my book, IT Strategy: align your IT vision for business value. An IT manager needs an organization plan that builds the appropriate mix of skills, experience, capability and capacity to meet your company’s technology support needs. Don’t spend more than is needed, , , right-size your organization. Includes a free download copy of my book, IT Organization: right-size your organization for success. There are key support processes you need to implement to provide more effective IT support and that enable your team to do their jobs. Follow this step by step training to implement these critical processes quickly. Tracking your technology assets is important so you need a few tools and a simple process to manage this part of your business effectively. This helps you be more organized and will give you a head start in budgeting and other management requirements. Includes a free download copy of my book, IT Asset Management: tracking technology assets. Provides a proven process to help you develop your own IT policies and procedures. The process helps you identify the policies you need in your company and how to go about developing them. Includes 23 samples that may be modified for immediate use. Includes a copy of my book, Practical IT Policies and Procedures. This class gives you all you need to target specific technology cost saving opportunities. Includes a download copy of my book, Technology Cost Saving Strategies that contains discussion of 50 cost saving ideas to help you get started. You need some key measurements to help you know how well your IT support team is doing or to monitor the improvement you are making as you implement certain support initiatives. In this class, I’ll give you a better understanding of the measurements you may want to track plus some examples of a few that have been helpful for me. Effective communication is a skill that every IT manager must have if he or she wants to succeed. It is absolutely critical. In this class, I’ll provide insight on what you need to communicate and include tips that literally force you to overcome a “lower desire to communicate” that most of us in IT have. Communicating effectively can be a major ingredient that helps boost your career.